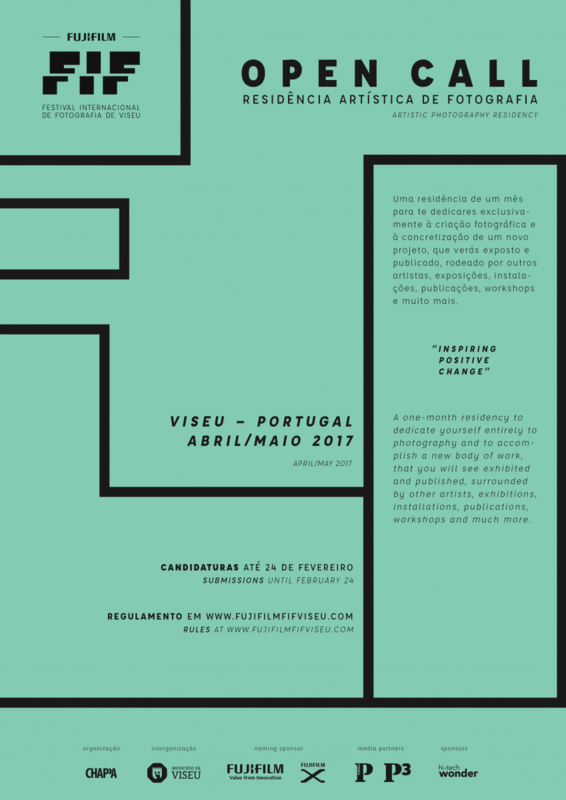 Open call to all photographers regardless of their nationality, for a one-month residency to take place between April and May 2017 in Viseu – Portugal. This residency will result on a photographic series that will be exhibited during the 2017 edition of Fujifilm FIF Viseu - International Photography Festival http://fujifilmfifviseu.com/en/home/ . The entire body of work will be edited in book in 2018 and released during the 2nd edition of Fujifilm FIF Viseu to take place that year. The selected photographer will also be required to hold a workshop aimed at students of photography / arts / multimedia and the presentation of the project carried out within this residency in a talk with guests to happen in this year's edition of Fujifilm FIF Viseu. The challenge is to look at the neighboring parishes of Viseu, promoting a broader understanding of their social and economic contours, valuing their specificities, bringing communities together and involving them in the photographic project. The residency aims to foster contemporary artistic creation and the development of a distinctive creative language for photography. Fujifilm FIF Viseu will guarantee all travel and accommodation expenses, and Fujifilm https://www.fujifilm.eu/ , the festival naming sponsor, will offer the selected photographer the brand new and iconic Fujifilm X100Fhttp://fujifilm-x.com/cameras/x100f/. When will the body of work be exhibited? During the Fujifilm FIF Viseu - Festival Internacional de Fotografia de Viseu (International Photography Festival), 05 May to 04 June 2017. On Fujifilm FIF Viseu’s Media Partner P3 (Portuguese only) and on Fujifilm FIF Viseu’s website www.fujifilmfifviseu.com, Portuguese and English.